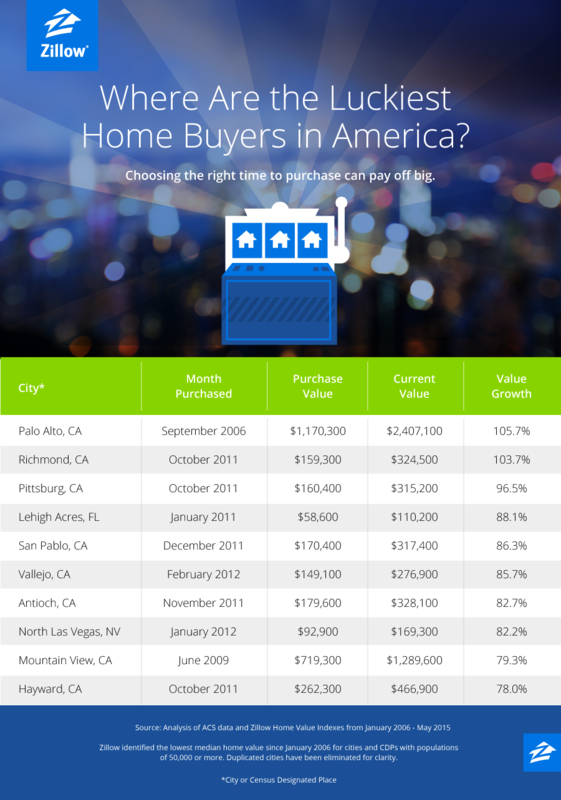 Dave Radcliffe Vegas » North Las Vegas home values up 82 percent? North Las Vegas home values up 82 percent? Las Vegas Channel 13 news just came out with a report that North Las Vegas home values are up 82% The report was based on data from a Zillow blog writer, Lauren Thompson and an evaluation of ACS Data and Zillow Home Value Indexes from January 2006-May 2015. The news report clip and Zillow Blog and chart of the “Luckiest Homeowners in Top 10 cities where homes were purchased in the right place, at the right time” is shared below. I caution you to pay attention to the details of the reports, as the data is based on just one home sale, not multiple properties in the area. While North Las Vegas Home values are increasing, and there are pockets of neighborhoods with some of the highest appreciation areas in the valley, a blanket statement of “an 82% increase for North Las Vegas Homeowners” is misleading and irresponsible. One home, selling for $92,900 in 2012 and then showing a current market value of $169,300 does not give a fair representation of the area and current home values and appreciation rates. Homeowners who are curious about your home’s value should contact a qualified Realtor, like David Radcliffe and his Team, The Radcliffe Group of Keller Williams Realty, for a true Comparative Market Analysis (CMA) of your property. Dave is a specialist on real estate home values and reports monthly on the statistical data for real estate home sales in Summelin, Centennial Hills and North Las Vegas, data that you can count on as real data of the specific area. A CMA can be considered both a work of art and a science. While a CMA is based on data, it also requires a Realtor’s local market knowledge of the area and intuition about which homes to compare and how to interpret the prices. A quality comparison of your home, with other homes that have sold, will include factors such as square footage, number of bedrooms and bathrooms, neighborhood factors, location, and condition of your home. Dave looks at and reviews recent sales data of comparable homes that are similar to yours, specifically home’s selling within the past two or three months and upward of six months (depending on what has recently sold). Homes that are no longer on the market, but have not sold, are often referenced to see why they may have been excluded from selling. When you are curious about your home’s highest and best selling value in the ever-changing real estate market, give Dave a call, he would be happy to help you better understand the market and sell you home for the highest yielding sales price, to help you get the best ROI on your Las Vegas Home, Summerlin Property, Centennial Hills and North Las Vegas home. Please contact The Radcliffe Group you will be furnished with a personalized FREE Comparative Market Analysis Report (CMA). We will prepare and send you an excellent detailed estimate of your home’s current value, and realistic selling value in today’s marketplace. The Radcliffe Group is here to provide any level of help and information you need make the home selling process easier and faster. Whether you are looking for a new home, thinking of selling your existing home, or just want help with an investment or relocation, we can help you. Great customer service for your biggest investment is my first priority! Tune into and subscribe to The Radcliffe Group YouTube channel to learn more about what is happening in your Las Vegas and Summerlin Communities. We promise to keep you updated with the latest real estate market conditions, real estate statistics and happenings in the area. information you need make the home selling process easier and faster. Great customer service for your biggest investment is my first priority! Please contact the Radcliffe Group Today. This entry was posted on Monday, July 27th, 2015 at 7:56 AM and is filed under Centennial Hills, Market Updates, North Las Vegas. You can follow any responses to this entry through the RSS 2.0 feed. Both comments and pings are currently closed.